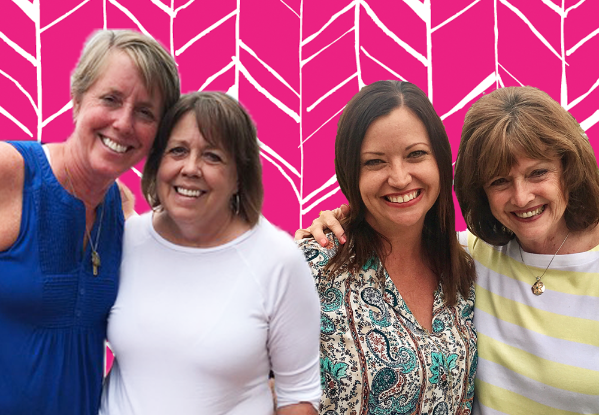 Jen asked YOU, her Tribe, to tell us your best friendship stories. After hundreds of responses on Facebook, we ended up with two sets of friends sharing their amazing stories with Jen—probably the most touching friendship stories you will ever hear! 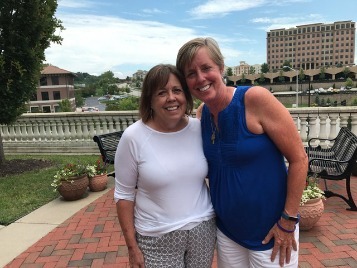 Vivian and Nancy recount the story of Nancy’s friendship with her friend Denise and the promise she made to her that altered the course of her life. Ann and Anne became “mother and daughter” after a series of events that will bring tears to your eyes. Get the Kleenex, y’all; these stories. We. Just. Can’t. Even. 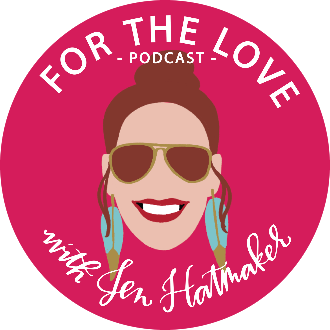 Narrator: Welcome to the For the Love Podcast with bestselling author Jen Hatmaker. Come on in, and join us for a chat with Jen and friends about all the things we love. Now, here’s Jen. So I got to thinking --all of our different series and the podcasts are interesting. We're going to have on experts, and authors, and sometimes really good friends of mine. and people who are really sort of a niche in their area. But my favorite thing about our tribe. has always been the tribe itself, that among us, there are so many amazing stories, so many amazing people, so many amazing friendships, and these wonderful encounters with God, and with people that should just have a wider hearing. So I decided for every series that we do on the podcast, we're going to “crowd source” one episode. So in other words, I went to Facebook and said “guys we’re doing a series on girlfriends; tell me your stories. Who's got an amazing girlfriend? Who has something we should hear? Tell us who you know and what you have seen“ The response was absolutely over-the-top. In fact, we had so many amazing nominations we couldn't pick just one, so on today's episode, we actually have two different sets of friends because we couldn't choose. So you're going to hear two amazing stories today and just real quick, I want to thank you, Tribe, for your incredible response, and I'm just I'm so blessed by this community. I'm reminded again why good friendships are so important. They absolutely carry us. They give us strength when we need them most. They bring us joy and sometimes, as in the story that you're just about to hear from our guests today, they carry a legacy that lasts even after we have left this world. So without further adieu, our first set of friends today that we're welcoming to the podcast is Vivian Foster and Nancy Cline. They have a story that positively exemplifies true and lasting friendship. They're both from the Kansas City area and you guys are just not going to believe their incredible story. It's amazing. Vivian was actually the one who nominated her friend Nancy, and I'm going to let them tell you all about this wonderful friendship journey they've been on together and where it all begins. So first off, Vivian and Nancy thank you so, so much for responding to our call for amazing friendship stories and for being on the show today. Vivian: I'm thrilled to do it. Nancy: Yeah, it's my pleasure and my privilege to be here with you and Vivian. Jen: It's actually my pleasure and my privilege. I just cannot tell you how much I appreciate your time and and really just your beautiful lives. I mean I am just blown away so. So let's jump into this story that you share with us. Vivian, so you nominated your friend Nancy, which by the way you did not get her clearance for, incidentally right. Nancy: You’re in trouble for that. Jen: Sometimes really good friends just ask don't ask permission—they just ask for forgiveness right? Vivian, you’ve nominated Nancy for this really amazing story you're about to tell us. It’s not only between you and Nancy, but the example that you saw with Nancy and her friend Denise. Vivian: Well, I have tons of great friends. When I read your post, Nancy's name popped up. Because I had the privilege of watching Nancy and Denise's friendship through good times, and bad times, and horrible times; and every situation in between. It's such a beautiful story of letting Christ direct your life, that I just felt like it was a story that had to be told. Jen: Yes, yes, yes, and amen. You are right ma'am. I am so excited to tell everybody this, just really beautiful story of yours. Now Nancy, we know this all really started with your friendship with Denise. So. 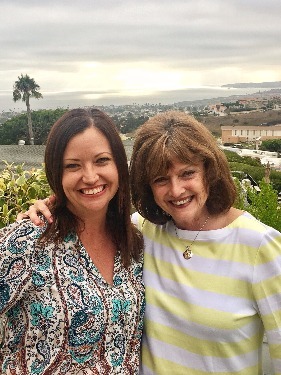 can you tell us a little bit about your friendship with with Denise Henning and how you got to know her, and the promise that you ultimately made to her as truly a testament to your friendship? I'm not an attorney, I'm a paralegal. From then on, we shared so many of the same interests; we both grew up in rural settings on the farm. Neither of us had family in Kansas City other than our spouses. At that time I had a two and a four year old—boys--and she and her husband Tim just immediately became close friends. We went to ball games together and we would meet for dinner out. Why she and her husband would want to hang out with us, and a four-year old, and two-year old--I don't know--we just became great friends. Nancy: …in our 24 years of friendship. So we just did life together and our husbands were good friends. She eventually had two boys that were were 10 years younger--her oldest son is 10 years younger than our oldest son. Then she had another son, and Tim and Denise and their boys were just family to us, really. So we got to do a life together, and it was a privilege and an honor to be her friend. Jen: How beautiful. And so you're just you're going right along. You're traveling together you're working together. You're in community together. And so what was really the first just kind of hard moment that you weathered together. Nancy: Well, in 2004, she was diagnosed with breast cancer. So, we were together and in her law firm then in 2002 she formed, she left the other law firm and started her own firm and asked me to come with her. So I did. In 2004 she was diagnosed with breast cancer, so that was the start of our cancer journey together. I've never really had anyone close to me that had chemo and had a mastectomy and things like that. So that was the first of us going through things together. She would be in chemo and I would bring her lunch or I would just come and sit with her during that process. Jen: How old were her boys at the time, more or less? Nancy: Her oldest one was four and a half and the youngest one was just one. Nancy: So for the youngest one, he's never known life without cancer as being a part of it. So the tragedy continued on. Denise had decided not to tell anybody, other than those of us who are closest to her. In May after the diagnosis, we were at her nine-year old’s baseball game, the youngest son, and the game had not started yet. But Tim was out hitting pop flies to the boys and came in and sat down in the dugout and collapsed. He suffered a massive heart attack, of which they were not able to revive him. So that night was like none I'd ever experienced before. II was there at the game and drove her from the baseball diamond to the hospital, and then from the hospital home to tell her two sons that their dad had not made it. That and all the while knowing, she and I knowing, that she had a non-curable cancer. There was a question in the car on the way there about you know “how could this happen? How could this be allowed to happen by God? How could this be part of a plan, how could this be right for her two boys?” But Denise, being such a strong woman of faith herself, she was just amazing. She could have written a book on how to be a mom in this type of adversary situation with her boys and just sharing with them the blessings; reminding them of the blessings that they had. Jen: What a wonderful thing to say about her. It was right about this time, right, that Vivian, you joined this small group that they were a part of? Vivian: That's right. I think I went to one meeting with Tim and Denise and you know then and then it's just been a journey ever since. Jen: Yes. That’s sort of where your stories intersected at that point. Jen: So Denise has lost Tim She's sick. Does this small group, is the small group sort of coming around their family at the time, as I'm sure they were? Nancy: Absolutely, yes. Absolutely friends within the small group. Vivian had just moved to the Kansas City area. I tell you, she was a gift from God. I mean, I have said that throughout all of this that God has just continued to put just the right people in my path as I have needed them; Vivian coming to Kansas City, and becoming a part of our small group, I think in February of 2012. Jen: How wonderful. Would you tell us a little bit about, Denise's, essentially her mission, after she lost Tim and her foundation, because that piece of her story is just beyond amazing. Nancy: Yes. If anyone can find a silver lining or try to turn a tragedy into a good thing, she would. So. she wanted to show her sons how they might be able to change or turn their tragedy into something that would benefit somebody else. So she, along with Tim's brother Dan Henning, and his wife Sherry and I, met and brainstormed about what we could do to turn this tragedy into something good. We ultimately decided, Denise decided, on the Henning Family Foundation; raising funds to place automated defibrillators in nonprofit locations all over the Kansas City metropolitan area and particularly starting at athletic fields, baseball fields, because there wasn’t an AED at the field that we were at that night that Tim suffered his heart attack. It could have possibly made a difference in his life. So Denise set out to raise funds, and our primary way of doing that was through a golf tournament. The first year we raised over $150,000. Jen: Wow. Did you really? Nancy: That’s also just a testament to Denise. She was an attorney in the Kansas City area; so very well respected and had been so generous throughout her life. So when she called on law firms, and lawyers at law firms, especially the plaintiffs firms, when she called upon them and asked for help in supporting this foundation, they were all in. Our goal was to place 100 AEDs at nonprofit locations in the Kansas City area. And today we've placed 122 AED’s. Nancy: And I'm still doing site visits, in fact next week, we're placing them at all the Boy Scout camps in the local area. Nancy: Yeah. So that's what she had the vision for. In fact, she was so blessed, and she would say that, that she was blessed, that this was curing for her and her boys, that she was at a baseball game, a couple of years ago, and the game had not started yet, and she noticed a commotion--an umpire had come out of the concession stand area and had collapsed. 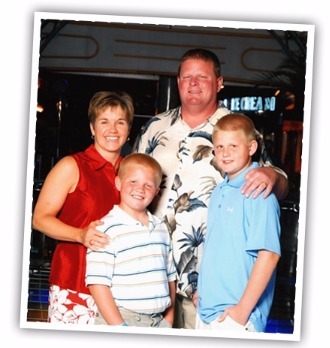 So Denise, who was not very well at the time, was having breathing issues, sent her son Brian to the car to get the AED; the mobile one that they carried in their car all the time. So Brian, thank God Brian was there, because Denise wouldn't have made it to the car and back with her current health situation. Brian ran out there and got back with the AED. There was a fireman there who had started CPR, Denise applied the AED to the umpire's chest and through the use of the AED, he was brought back to life. He had no pulse, he was not breathing, he was blue up to his chin. But the use of the AED brought him back to life. Jen: I have goose bumps down to my toes. Vivian: Tell me that’s not God. Jen: I have goose bumps everywhere. That is so amazing. So outstanding. I'm so happy that she was able to see that sort of fulfillment of her mission—that she was right. She chose something important and necessary and it saved a life in front of her eyes. It's unbelievable. Nancy: Right yes, for all the AEDs we placed, it was hers and they used it. Her family coming together between her and Brian to make a difference in the life of that umpire's family who was a father of two and had a wife at home. So it was a blessing for them. She would say it was curing to see the difference that they had made in the life of that family, that they had prevented a tragedy so that someone else would not have to go through what she and her boys had gone through. Jen: That's right. It's amazing. So what happened next in this story? Nancy: Well, the next part of the story is that a year ago right now, Denise became very ill and so she spent days in the hospital. Unfortunately, at the end. She passed away on September 11th, 2016. Vivian: But guess who sat with Denise in that hospital for 40 something days. Vivian: Absolutely it was Nancy. 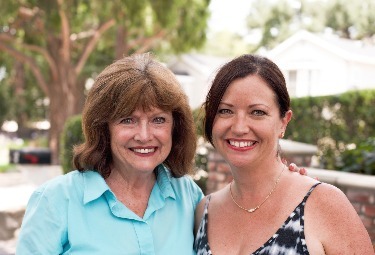 Nancy and Denise went to California looking for more treatment, a different kind of treatment. That was Nancy that made all that happen. It's an amazing story of putting putting feet to Jesus. I still, even knowing this story, I still get goose bumps. Jen: It’s a real gift, in so many ways, to log those last days with someone that you love and just your presence; you can't say anything to make it better, or easier, or fix it. But just that steady presence for 48 days in the hospital; if that's the only legacy that you ever left on this earth. it would be beautiful and worthy. That's truly amazing. So after 48 days she lost her battle? Nancy: She did, yes she did. She was brave to the end. Just amazing, and it was a privilege for me to be there with her through that. Unfortunately, she did not have a family member who could be there through this. So clearly, God made us sisters, 24 years ago, and blood did not need to be part of that even though we were both B positive. Nancy: It was a privilege and an honor to have lived that and been there and it was really a family effort because my husband was so supportive and allowed me to be there day and night. She was in ICU and wasn't really able to direct her own care and I was the power of durable power of attorney. My son Andrew literally spent five weeks at the Henning house just being there for the boys. Nancy: Our families were so intermingled like that. Andrew had been the boys’--Brian and Matthew, Tim and Denise's sons-- had been their child care provider since he was a sophomore in high school every summer. He did that for them. He just stayed with them. So then, at age 26, he was prepared and knew exactly what the boundaries would be, and how to love those boys dearly. They knew, knowing that Andrew was hurting through all of this too because Denise was like a second mom to him. Jen: Of course. You were like sisters and all four of your sons were more like brothers. 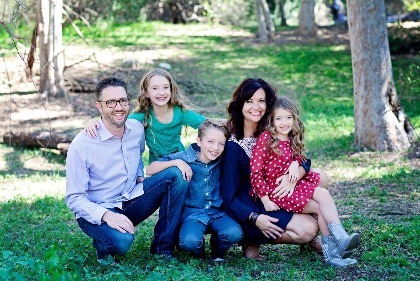 Jen: I think so often of that scripture where God says, “He sets the lonely in families,” and I just think sometimes He just makes a family out of random people. He puts us all together with somebody unrelated; not flesh and blood, not from the same place, but at the end of it, it is every bit as much family as any family I've ever seen. Jen: It’s precisely what you've shared, So, when Denise passed, what happened next? Nancy: Well we actually we are now raising her two sons. She and Tim’s two sons. This was something, that of course, was distressing Denise, years prior to her passing, about what would happen to her sons if God brought her home. Jen: How old were they in September when she passed? Nancy: They were 16 and 13. So they're now 17 and 14. We've gone through some of these, so many of these firsts without her. So my husband and I left the hospice house when Denise passed and had to go to their home and to share that news with them. Then, just to reassure them that we would never, God willing, we would never leave them, we've been at their house ever since, which was what her wish was; that her boys would be able to stay in their bedrooms, and in their neighborhood, and in their school. Jen: It’s too much, I can’t handle it. It's precious. You just moved right into their house, and you’re still there and you’re raising a second set of sons. Nancy: She has raised such amazing--she and Tim--just raised such amazing compassionate, caring kids and of course they’re teenagers. So that that comes with all the ups and downs of that. Jen: Yes. I have three teenage sons. I understand. Jen: So you’ve got one looking at college? When we were jumping on the phone, before we started recording, you're at a baseball tournament as we speak? Nancy: We are in Florida right now for a U14 baseball tournament. Jen: You’re in the thick of it. Nancy: Yes, we have to be at the field at 7:00 a.m. tomorrow morning. Jen: Oh man, oh my word. Nancy: Thankfully, we love this. I mean God picked the right ones. Jen: Well, you know how to raise two boys. Nancy: I have been there done that. I’ve said that those were my practice kids, and maybe I can get it right this time. God Is giving me another chance. Jen: That's too much. Oh my goodness. It's just too beautiful. It's the most beautiful story I've ever heard. Vivian, can you jump in here and talk a little bit about sort of your story with Nancy, and your journey, and your diagnosis and what your friendship has looked like? Vivian: Well. from the very first day I walked into her house for small group, those arms opened up and we had a connection. You know. 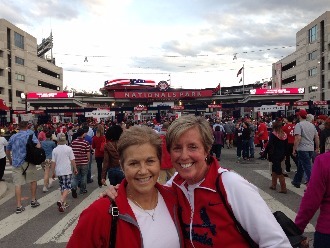 so sort of from afar, I watched Nancy serve Denise, and then in 2013, I was diagnosed with breast cancer. It would have been so easy and so understandable for Nancy to back away and say, “I can’t do this, I've been there done that. I can't do that,” but that's not Nancy. She wraps you up in her arms, and she checks on you, and she wants the best for you, and she prays for you. It just really touched my heart because she was in the midst of something really bad. Jen: Yes, that's really profound to sort of go back to a really tender place where there was so much loss and pain and suffering and say” I'll stand by you, I'll stand with you even here.” I mean that is truly beyond. I'm so incredibly moved by that. So I'm thinking about our friends our friendship with other women. It can be so instrumental, as you are so beautifully describing, just to our health and our well-being. Sometimes it seems like the ones who love us most, are almost they can almost read our minds. They are almost telepathic. We can almost just sense when someone close to us needs something at any given moment. So Vivian, will you tell us just briefly how you sort of listen to that prompting of the Spirit that brings Nancy or really any friend of yours to mind, and why you think it's important to sort of act on that voice, act on that prompting; on that instinct to call a friend or to reach out. Just to remind them, “hey. I'm thinking about you today, I'm praying for you today. God brought you to mind today,” can you talk about that for just a minute? Vivian: I can remember one time calling Nancy, and she happened to be at Denise's grave. She had taken flowers and she just needed me at that moment. Jen: I really love that, because in my life, when I have been hurting the most, or I’ve been suffering or I'm feeling lonely, or I'm terrified; for me, nine times out of 10, the singular way that I have felt God's love, that He sent His presence or His comfort or His assurance, is through another human being. Jen: So, let's not despise those tiny little nudges. It doesn't have to be monumental. We don't have to write a 10-page paper to somebody solving their problems, but rather just the little check in, “Hey I’m just thinking about you right this second.” You just never know how deeply that's going to matter in that moment. That's precisely how God leads us. It's always a little whisper. It’s rarely a two by four upside the head, it’s those little nudges. Jen: Sometimes the two by fours. Sometimes. I'm stubborn. So. I get that sometimes. Nancy: It’s so easy - even with me correcting all the auto corrects. Nancy: It takes 15 seconds or 20 seconds and it can mean the world. I really do think, like Vivian was saying, that if we just listen, God is putting on our hearts, people who He wants us to be intentional about touching their lives that day. Denise was really good at that. I have to say too, that there could have been 30 people at her celebration of life that would say “Denise was my best friend." Nancy: Because she took the time to do just that. She would help anybody who called - people, other cancer survivors, people looking for job, people looking for jobs for their kids or a nephew or whoever. She would always just take the time. I mean, she'd be driving and writing a post-it note on and putting it on her dash because she had just been nudged by the Holy Spirit to reach out to somebody, and she didn't want to forget it. She wanted to follow up on it as soon as that was safe for her to do so. Jen: Vivian is that way too. I just know it was an answer to God. because when I was sleeping in a recliner in the Neural ICU, and I would wake up in the morning and have a message first thing from Vivian with some little word of encouragement or a Bible verse or something that was on her heart. It just would make it possible to get through the day. I mean, it was those little things that just helped make it through the day. Thankfully there were other friends, girlfriends that were doing that too, because I think there's so many wonderful Godly women out there. Man, you’ve just got to cling to them, so we can get through this. Jen: That's it. I mean if there’s message that I've heard and said and agreed with over and over during this series, is that girlfriends of this caliber are a real and wonderful gift. I mean, a treasure, truly a treasure. You know we're going to get to the end of our life and we'll have a handful of things that we can look back on and say “these were the things that truly counted.” This level of friendship, these kind of women in our lives--that's one of them. It is going to make the cut. This lasts, and it's beautiful. and it's powerful. It’s actually powerful enough to see us through suffering, and loss, and grief. I'm just stunned by how lovely your friendship story is. It's truly inspiring. I thank you for for being the kinds of friends that you are to each other and that you have been to Denise. Just to even get to peek in just for a minute on this wonderful, wonderful little piece of humanity on our planet right now, has just absolutely. just strengthened my faith and and encouraged my resolve to be a good friend. I thank you so much for sharing it. Jen: Pretty amazing right? Amazing. Nancy and Vivian and their story about Denise. Just, my heart's just really, really full from it and I hope that you loved it. I hope you've enjoyed their story and that it moved you and inspired you in some way to cherish your friends like this or be a friend like this and I'm just reminded as I listened to their really lovely story, that just good human beings are everywhere. We don't have to look to the famous people or the ones who are published or on TV. We are just literally surrounded by such goodness, that people are wonderful, and they're showing up for one another and they're good friends and they're good people. Nancy and Vivian were just a wonderful example of that. So I'm so grateful that they were on. I'm so glad that I got to share their story that they said yes, because neither one of them like the spotlight. So we sort of shoved them into it and we're all better for it. Special Note From Jen: Guys, just a real quick little break here in the show to talk about something super near and dear to my heart. 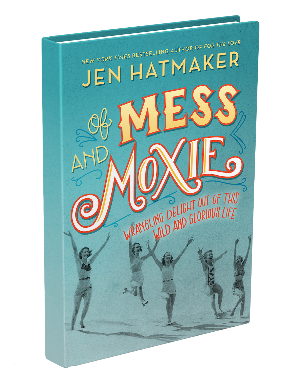 So you may know that my newest book is called Of Mess and Moxie and it comes out on August 8th. We're almost there. I absolutely loved writing this book for you, and I hope that you will love reading it. I think this is my favorite book to date. My goals with this book is that at some point in the reading, it will positively make you laugh, hopefully out loud; it may make you cry. I hope it makes you think. I certainly hope that it inspires you, and encourages you, and gives you permission to live your wild and glorious life, in the place that you've been planted. It was just a real delight to write for you. Hey listen; if you preorder it before its release date--any time between now and August 7th--you get a bunch of cool free stuff too. My team put together this amazing pile of goodies for you; it's so easy. So if you're ever going to buy it, you might as well get it now. Get the free stuff before it's released. You can find out all the information on that, on the book's website. It's called OfMessandMoxie.com, and all the links are in there and everything you need. You can get signed copies, you can get a really cool collector's edition box set, and all the information on your pile of swag is over there too. I can't wait for you to have it. I can't wait for us to talk about it. I hope that it serves you so well because it was a delight to write for you so, OfMessAndMoxie.com; go snag it! Okay! back to our chat. Jen: Super excited to introduce you to another pair of friends who have just this really amazing. moving account toward the power of a promise made between two friends and so guys, I am so just honored that we have this community, because when we asked; when we went to social media and said “Tell us your stories, who should we know about? Who should we hear from?” You showed; up you responded in spades. So as I mentioned before, it was it was so hard to pick just one story from all of your nominations that we actually couldn't do it. So even though we could have positively shared 100 stories on the series, we decided we at least had to share the ones that got the most response from from you also. Thanks again for just being so faithful and having so much passion in our shared space. It just really never ends with this group. So you told us overwhelmingly that you wanted to hear from these two ladies, as we sort of saw their story just in a tiny little piece on my Facebook page. Hundreds and hundreds and hundreds of you said, “we want to know more.” So on to our second tear-fest for today because the story that you just heard Vivian and Nancy tell was just so great and so moving. So get some more Kleenex y’all, because I am so honored to introduce you to our next guests, who both live in the southern California area. So we've got “Ann with no e” Pearson. “Anne with no E” was the one who nominated her mom's very close friend Anne, and she's “Anne with an ‘e’,” who for the rest of this interview, we're going to call Grandma Anne. OK, so we've got Ann and we've got Grandma Anne, and I'm going to let them tell you about this beautiful friendship between Ann’s mom Peggy and Grandma Anne that has led to their strong. really special bond over the last 30 years. So Ann and Grandma Anne, thank you so much for responding to our call for amazing friendship stories and being on the show today. Grandma Anne & Ann: Thank you. Thank you for having us. Jen: Absolutely. OK so Ann, you nominated Grandma Anne. 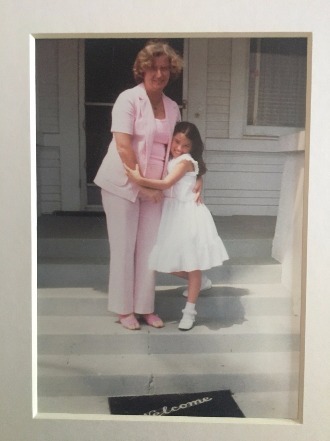 You mentioned when you saw the post on my Facebook page that it wasn't even a split second before you felt prompted to nominate Grandma Anne and talk about the friendship she had with your mom Peggy, and then ultimately her presence in your life. So tell us what immediately came to your mind when you saw the post asking for a friendship story, and why did you want people to know about Grandma Anne? Ann: You know, it really happened so fast and I think, because I had been thinking about our special relationship, our friendship, because we had just celebrated Grandma Anne’s birthday over the weekend and I was at this wonderful party that her daughter Erin made for her and we just there with her family. My husband and my kids were there and it was just part of the family and I was thinking about how special, how really special that friendship was and how Anne has shown up for me, and for my sister, and now my husband and my children for our lifetimes. I can't remember not knowing Anne. I met her when I was three years old. So, when I think of friendship, I think of Grandma Anne. Ann: I think of that loyalty, just that commitment. That commitment to me and my sister and our family; and how much that takes throughout a lifetime. You know it's not a small thing. Jen: No, it’s not small. Ann: To be there through all those years, no matter what. So that's what really struck me and I just wanted to shine a light on that, on her, and just how blessed I feel to have her in my life and how inspiring that is. You know, you can be one person and make such a difference in other people's lives. It doesn't have to be through huge things, just checking in and seeing how someone's doing in good times and then the bad times. Jen: You are absolutely right, although I would call this story kind of huge. Let's get into it, because it's so dear So Grandma Anne, we know that this whole thing really started with your friendship with Peggy; Ann’s mom. Can you tell us a little bit about your connection with her and how you got to know her, and then ultimately about the day she asked you for a promise, that would then alter your course for the next 30 years? Grandma Anne: When I met Peggy, I thought, “oh this lady is awesome.” I loved her attitude. She had Ann, and I had my Erin, and Erin looked exactly like Peggy, and Ann looked exactly like me, which was very funny at the time. Jen: How old were you guys at the time, as mothers? Grandma Anne: I was, let me think about this now, I was in my early thirties, and she was older than me. Ann: I think she was about 10 years older than you. Jen: Okay, you were just in the young adult years of raising babies, obviously, like so many of my listeners are. Grandma Anne: Yes, and looking for a role model, and I did find that in Peggy. She just has this attitude that was so beautiful. You know, we're all struggling and searching, and we all have husbands we have to take care of, and babies and we have to take care of younger children. I just admired her so much. We could laugh together, and we could just put our heads back and just laugh so much about the little things in life. Like Ann said, it's not the big things, it’s the little things. Then we continued our friendship. We talked about a lot of things; we talked about faith, we talked about family. we talked about parenting, communities, commitments, what is a friend? It came to walking along the ocean and talking, one of the times Peggy said to me,”if anything ever happens to me, I want you to take care of Ann.” And I said, “oh without question. But nothing's going to happen to you and if anything happens to me, of course you'll do the same.” You know, I didn't think much of it. We went through a lot together; we talked about each others family life, our finances and then one of her children, her oldest was getting married. So we had a big dynamic there, and it just kept evolving and evolving. Then Peggy very, very very tragically, unfortunately, passed away. Ann was only 10 years old maybe close to 11. I just was completely devastated. I was heartbroken, I ran over to the house and you know, it's like,” I've got to take over now.” I went to Ann, and I said “I’ll be your mom,” and I thought How rude of me to do that , her Mom just passed away. My goodness what am I doing? I gave her a big hug and said, “what do you want to do?” She and Maria her older sister said, “we want to banana bread,” because Peggy made the best banana bread in the world. So we went out to the grocery store, and we must have looked like quite a group. Grandma Anne: We went and bought everything we needed for banana nut bread, and I was thinking, “oh please God, let me make it nearly as good as Peggy, I know I can’t, but I'm going to give it a whirl—c’mon Peggy help me out here,” And we went home and we made banana nut bread. It just got to where it didn't get easier, but we could get through it because we had each other. So my day by day, and I'm just watching Ann grow and having her as part of our family, and letting her know that she was part of our family—that was automatic. Jen: Ann, let me ask you before we go on in the story, of course you were just 11 when you lost your mom. I mean, nobody's ever prepared to lose a mom, much less when you are that young. Can you talk us through kind of your side of of that season, and what your experience was, even up to that point with Grandma Anne, and who she was to you in your childhood, and then since? Ann: Yes. You know what was interesting, about you know even before my mom passed, Grandma Anne was already somebody very special to me. I spent a lot of time with her family. I played with Erin-- it was a special time for me. I'm the youngest of four kids. So my older siblings we're all busy and doing their thing. So it was special, you know I got go with this other family, be a part of their fun days. They lived at the beach, so we spent a lot of time on the beach together, kids just running around, having a 1980s summer. Ann: It was a lot of fun for me, and I always loved being around Anne. I really feel like my mom saw that connection, and and maybe that's what prompted her to say, to talk to Anne about that. I always loved being around her. She was always a really fun mom; she made the car rides fun, you know going to dance class, she drove me to dance class. Jen: And you mentioned it was in a big fancy convertible Cadillac, so who wouldn’t love that. I want to drive in that right now. Jen: I'm sure. I want to drive in it right now. Ann: When you drive to Lake Arrowhead with the top down, great memories. great memories, childhood memories. So when I lost my mom it was very shocking, my mom was not sick. She had a massive heart attack and it did happen at my brother's wedding reception. So it was a day of celebration and a lot leading up to that day. It was stressful, and family and things kind of coming together. At the last dance, she had her heart attack, and she never regained consciousness. Jen: Wow. She couldn’t have been what, 40? I remember that very specifically. So to get the news that she had passed was shocking and unbelievable. Ann: In that 24 hours, it was a life changing loss. I was still in that age range where things were going to be different, probably if my mom had lived. I probably wouldn't have gone to the schools that I did, because my mom was very conscious of my education. She had her plan for me and really that all kind of fell to the wayside after she passed away. So yeah, it was very life changing and very much like, “who's going to take care of me?” My dad was sort of not equipped really, and I think he just kind of thought, well we were mostly big, you know the older siblings, were older and and I think he was kind of mostly done. Which was fine, it just wasn't anything that he could really handle. Jen: Which kind of makes Grandma Anne’s presence in your life all the more important, I mean, all the more crucial to have a mother figure. Ann: Yes, very much so. She was there, and she kept the contact. She would for years take me to dance class, and that was sort of our connection. We’d go out to eat and I felt so special being just part of the group. It always felt good to be a part of whatever was going on with them, and it felt special, and I had that to myself. That was my special connection with Anne, and with Erin, and her brothers and Anne's husband West. Anne’s husband West; you know, he doesn't say much, but when he says it, I mean, it's to the heart. Jen: I love people like that. Grandma Anne: Well, Ann was his little girl too, he lights up whenever he sees Ann. That’s his special gal. Jen: That is so dear. So Grandma Anne, I mean really, it’s noteworthy and really monumental, the level of commitment that you kept. I mean I can't, you mentioned it, but I can't imagine walking along the beach with your friend who's perfectly healthy in her upper 30s or early 40s, asking you to care for her kids should something ever happen to her. It just feels like a fake idea.? Who could ever imagine that? Then for it to come to pass or shortly thereafter. Then, for you to stand by your word; not just not just in the next few months, but for all these next decades. It's really, really extraordinary. I mean, was there ever a moment where you thought anything other than what you did, that maybe I've gotten in over my head? Or was your friendship with Peggy and your commitment to Ann and the kids just so certain and so sure that nothing else ever occurred to you? Grandma Anne: Nothing else ever occurred to me. The only thing I can say is I would worry so much sometimes that I wasn't doing enough. Because Ann is really like my daughter. I mean, it keeps that connection with Peggy. We just had this incredible friendship and it passed down to her kids and especially Ann. You know, when Ann had her wedding, I was so proud of her and I was so proud of who she picked. I knew Peggy had her hands in that through grace, she picked that perfect guy. That’s Peggy. She's still with us she's still right there. Jen: I love that. I love what you're saying because you've both you both mentioned to us earlier, in your pre-interview with us, that it's really been healing and comforting for you both to remember Peggy and to just to honor the connection you had when you were together. When you guys are together now, in fact you both describe little moments where you feel like Peggy's spirit has been present. These little nods of encouragement through some really important landmarks of your lives, little winks, Ann,] from your mom. So can you talk about that a little bit? How have you sort of kept her memory alive and where have you sort of felt her spirit and her presence since? 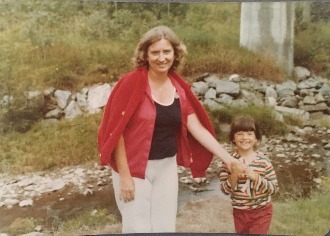 Ann: I think in the beginning of that, I'd have to say the first thing that I needed to do with the loss of my mother was I needed to forgive my mom for dying. Ann: I had to get forgive her, Then, I needed to accept everything that was coming at me as a blessing. I think that once I was able to do that, it just kind of opened the door for her to start showing me how much she loves me from heaven. I don't know. Through God's grace, I just felt like God has had such a hand on on all of this, and God is showing me how much He loves me through little winks from my mom, or for Grandma Anne; just her presence, I just feel that love from God through those things. I would have to say, just when we’re together, I feel her presence. Those landmarks; when you lose your mom at a certain age, especially when it's pre-teenager, you still have that idealized fantasy of having a mom. So for my wedding, it was so special having Anne there. Then later very shortly after, a year after we were married, we had Charlotte. Anne was there at the hospital, holding my baby. I just felt like my mom was there too, you could feel the energy in the room. Grandma Anne: Charlotte looks exactly like Peggy. Jen: That is so dear. Grandma Anne: It really is. Jen: You know if ever you're missing your mom, Ann, you can just look at your daughter. Get a little look at her face. 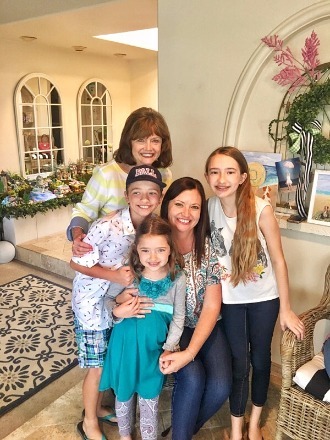 ​Ann: Each of my children there's a little bit of my mom, but the one that looks the most like my mom is Charlotte. It does make me feel good--it reminds me that she existed. She was here. you know because after so many it does get to be a long time without her. Those little reminders. ​You know my husband, and I'll say, my mom's favorite musical was the Sound of Music, my sister is actually named after Fraulein Maria. So I’m dating my husband and we are getting to know each other and he was saying how he was in musical theater in high school and I said “oh, you know, what were you in, that’s cool?” And he said, “oh, I was the Captain in the Sound of Music.” And I thought, okay, I'm marrying him. Grandma Anne: There’s the wink. Jen: There’s the little nudge from heaven. Here's your guy. One thing that I was really just struck by, something that you said Ann, was that just having Grandma Anne in your life, specifically, as we're sort of talking in this series about friendship in as among women especially, that having Grandma Anne in your life made you feel like you belonged somewhere, after your mom passed. As an 11-year old, I can only imagine how crucial that was to your wholeness and to your sense of well-being, having lost your mom. I'm just really moved by the idea of women who have this amazing capacity, like you do Grandma Anne, to create these places of belonging for other people who desperately need it. It's so, I mean I don't want to overstate it in any way, but to me it's just very holy and sacred. It is one of the most important blessings and gifts we can give one another in this life, is a place to belong. Where we know for sure this person loves me. This person is for me, this person is in my corner, when I have nowhere else to go. I know I can put my feet on a path that leads to this person's home and always be welcomed. There's something so incredibly special about that. I would love to hear anything you guys can say about that just in general. Why it has been in your life and why you consider it still important to impart this sense of belonging to others, especially when they may be feeling disconnected or unanchored. Grandma Anne: For me, it gave me the ability to continue to be connected to my very dear friend Peggy. Jen: My heart is melting. I have melted right here in my office. Ann: That's very special for me. When you agreed, when we were talking about what to call you, and you said Grandma Anne, that mean so much to me. ​Grandma Anne: Yes, of course. Ann: You know they see they get to hear and see a lot about how their dad grew up and all those good things. Grandma Anne has been my connection to my childhood in a lot of ways, and the connection to my mom because there’s not a lot of friends left, and here's Anne; she just steps right in, Grandma Anne to be a grandparent to my kids. It has been you know just such a joy to see them all together. She just spoils them rotten. Ann: Just to have those special adult relationships with family members. It's family and it's a connection and Grandma Anne can tell them stories about me when I was a little girl. That to me is just so important for the big picture of my life to still hold on. I don’t want to forget my childhood, there was a lot of really sad things that happened after my mom died, but this is one really amazing thing that happened. Jen: I can absolutely see why, Peggy asked you, Grandma Anne, should anything ever happen to her. I'm trying to put myself in Peggy's shoes, and obviously she would never have chosen to to to have to miss the rest of her her life and her children's growing up and their adulthood. But I cannot help but think, what a comfort it would have been to her obviously to know, that here I am talking to you all these years later, and you are still this precious, integrated, essential part of Ann’s life and her husband's life and her children's life. You did exactly what she was hoping. It's just the most wonderful story to watch you honor a commitment you made on a beach decades ago, and have it produce so much beauty in the life of this young family, and in their future, and in their kids future-- it is truly truly beautiful. I am just thrilled that you have shared it with me. Let me ask you guys this. We close every episode with a couple of questions that we ask everybody, and we would love to hear your take on these too, because now that we have gotten to spend a little bit of time with you, I guarantee you that everyone listening to this podcast is going to want to be your best friends. And you know what, I looked through all your pictures too, and your pretty spicy. I mean, Grandma Anne, you’ve like got it going on. I mean, you are stylish and fierce. So anyway, you may get stalked after this. I'm just telling you. OK, here's the first question-- so this is to you, Grandma Anne. We've all been given a lot of advice in our lives; some good and some bad. Can you tell us either the best advice or the worst advice, or both, that you've ever received? Grandma Anne: Well, my mom told me a long, long, long, long time ago, “Live each day to the fullest. You don't know what's going to happen in the future. So live each day to the fullest,” and I've really tried to do that. Jen: How appropriate, even for your story here with Peggy, that is just the truest thing. Ann: Oh, that’s funny. I think ironing. If I ever iron anything, for you, I really love you. Jen: Oh yes, No. Oh no, I don't. I don't iron at all. Brandon does all of our ironing. Grandma Anne: You know Peggy used to iron all the time. Jen: Oh, it skipped you Ann. You don’t have that gene. Ann: My husband wakes up at 4:00 a.m. He's a contractor and he gets to work really early and if he can sleep 10 more minutes, I feel like I am going to iron his shirts for him. But it is done very angrily and begrudgingly. Jen: An angry iron. I get this. Jen: I have flat out refused to buy plenty of clothes for myself and my children because they require ironing. I'm like, I don't have time for this. You get a straight cotton t-shirt or you get nothing. OK here was last question and I'd love to hear from both of you. Jen: A question that Barbara Brown Taylor once asked in one of her books, and this can be as serious or as lighthearted as you want, and here's the question: what is saving your life right now? Grandma Anne: Saving my life is my faith and family is what saves me daily. Jen: Me too. How about you Ann? Ann: That’s so good, you know that the first thing that came to mind was Netflix. Jen: Oh sure. What are you watching? Ann: Oh, my husband and I are watching Bloodline. Jen: That's a serious show. This is a really a legit show. Ann: You know the Netflix kind of ties in with time with my husband in the evenings, and we’re watching Bloodline right now, and we can sit and just have that downtime while the kids are watching something else, or outside playing. Jen: How long have you been married? Ann: Dale and I have been married for 14 years. Jen: After that many years, I mean you don't need a lot of romance, you don't need a lot of adventure. It can be as simple as sitting on a couch, holding hands, and watching Netflix to reconnect. That is like magic, especially when the kids are asleep. Jen: So Ann & Grandma Anne, I am so grateful to now count you as friends and I cannot thank you enough for your beautiful lives. Your amazing story--thank you for taking the time to talk to me today; just for sharing what was a really hard part of your life that turned into a really beautiful wonderful part of your life. I just know that is going to move and inspire and touch so many people that are listening. So from the bottom of my heart, thanks for being with me today. Grandma Anne: Thank you so much. It was an honor and a pleasure, thank you. Jen: I just cannot thank my guests enough today; just these really extraordinary women and the beautiful stories they've shared with us today of friendship, and loyalty, and commitment; just over the top. I hope you loved them. I hope you are moved by them. That wraps up our very first podcast series on “For the Love of Girlfriends.” It’s just been a real joy to me to have all these amazing people on the show, and learn so much, and laugh so much, and just get a glimpse into some really phenomenal people's lives and their stories. So I hope you loved it too. I hope you're enjoying the podcast. We've got a really great series coming up next. We have some outstanding guests lined up that you're absolutely going to love. I cannot wait to bring you the very next series, which is going to be, “For The Love of Moxie.” So you are going to meet some people who literally define “moxie” in every way; in their careers, and their families, in their relationships as overcomers. It’s just over the top, you guys, over the top. I can't wait to start bringing you those episodes. So thanks again for joining me on the “For The Love” Podcast. I'm having such a ball with this, and I hope you are too. I'll see you next time. Narrator: Thanks for joining us today on the “For the Love Podcast.” Tune in next week, when we sit down again with Jen and friends to chat about all the things we love.